Remember this listing I debuted here on RyanBooneRealEstate.com last week – with its prime Wade Avenue location and that awesome price tag under $300k? Well, I’m pleased to report… we’re under contract after just three days on the market! 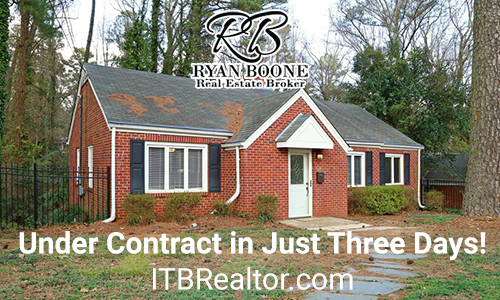 ITB listing under contract in just three days! Still on the hunt for your own home inside the beltline? Just because this home is now under contract, doesn’t mean there aren’t still great options out there ready for you to see them! Contact me anytime to get your search started. And if you’re considering a spring sale, I’d love to talk strategy, market inventory, and pricing with you. Feel free to give me a call at 919-438-0548 or email me at Ryan@HudsonResidential.com.